Centering Corporation is a non-profit (501 C-3) organization dedicated to providing education and resources for the bereaved. Centering was founded in 1977 by Joy and Dr. Marvin Johnson. Centering started with nine little coloring books for hospitalized children and two workshop offerings for nurses and families. In response to the need for support by families and caregivers while facing their grief experience we developed many new resources. Today we have over 500 grief resources for children and adults. Centering continues to provide educational resources and bookstore for caregivers and families. And in overall, over 2 million grief resources are in the hands of grieving families and those who care for them. 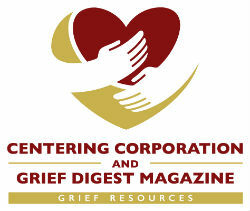 Grief Digest is a quarterly magazine supporting grieving people and caregivers. The Centering Corporation, which is the largest and oldest grief resource center in North America, has created this resource by gathering a remarkable group of writers to aid you in your journey. Our reader-friendly magazine includes the best writers and speakers in the field of bereavement. There are many interesting and helpful articles on coping and dealing with grief, help for the caregiver and most of all, the usual quality and support you expect from your Centering family. Article submissions are encouraged. You may submit them digitally to centeringcorp@aol.com or through the website under Contribute an Article. Contributors receive free copies of the magazine as well as a resource page in the magazine. Advertisers may purchase space in print or online. However, due to the sensitive topics covered in Grief Digest, we reserve the right to review resource pages prior to publication.